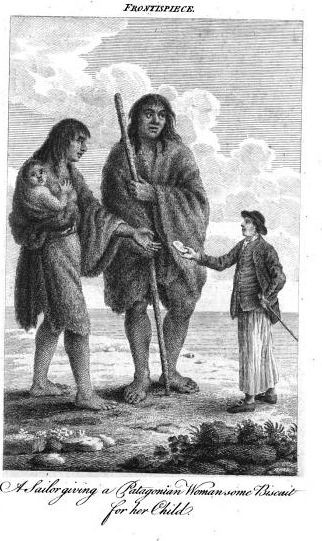 A Sailor Giving a Patagonian Woman Some Biscuit for her Child, Frontispiece, A Voyage Round the World in His Majesty's Ship The Dolphin, John Byron, 1767, Google Books. Maritime history of the eighteenth century is not defined solely by conflict, it was also a time of great exploration. Captain Cook's voyages are the most well known, but there were others. Commodore John Byron's clearly fanciful account of his voyage on the Dolphin is illustrated and provides us with this piece. In it, a seafarer offers his hardtack to a woman of preposterous size, only outsized by her husband. Even the infant clutching her breast is as large as the sailor! We cannot rely on this image of a people who the illustrator knew his readers would never meet. The sailor, however, was too common a sight to fake. Our mariner wears a short brimmed round hat with short hair. 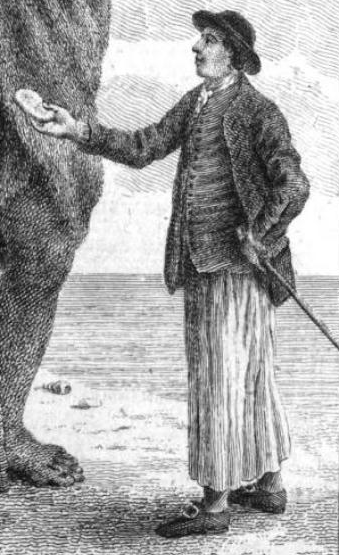 A long waistcoat sits beneath his short jacket with mariner's cuffs. Both are single breasted. Exceptionally long slops hang almost down to his feet, where white stockings and round toed shoes complete his rig. As we might expect, a stick is in his left hand.